The CAN-MD® Console and Controller brings the power of CAN-MD® to the cloud. Now with this exciting new software platform, CAN-MD® smart vibration sensor systems can be deployed in the field and monitored from anywhere in the world. 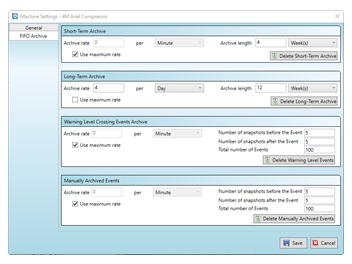 The easy to use CAN-MD® Controller software allows for configuration of CAN-MD® system settings and database archiving of CAN-MD® Condition Indicators. The CAN-MD® console allows the archived data to be monitored remotely and notify users when faults are detected. The CAN-MD® Console is configurable with a variety of analysis tools, trending, custom alarming and database options. Continue reading below for more information on the CAN-MD® Console features. Log of all archived events, including associated trend, time waveform, and frequency spectra plots.